for $550,000 with 4 bedrooms and 4 full baths, 1 half bath. This 5,070 square foot home was built on a lot size of 100 X 180 X 138 X 181. Vacation at home with gorgeous sunset views overlooking Royal Fox Country Club! 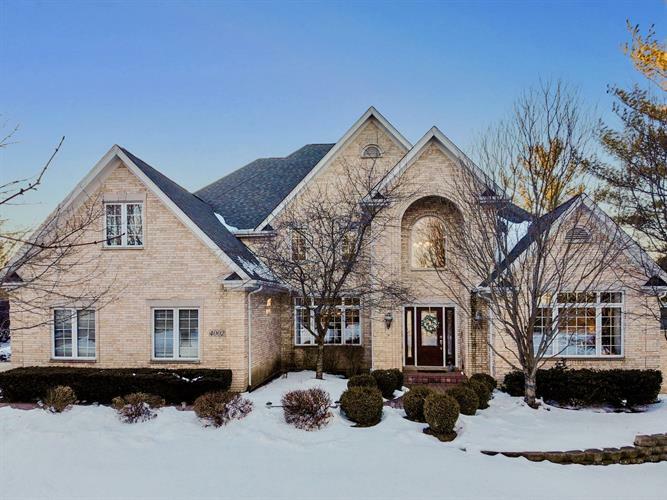 4 bedrooms PLUS loft, 4 + a half bathrooms, 4, 500 square feet AND a fully finished English basement w/ an expertly appointed bar & luxurious 800 bottle wine cellar! This home boasts 1st & 2nd floor master bedrooms each w/ private bathroom en-suites! Light & bright kitchen features 42" white cabinets, stainless steel appliances, granite counters, a walk-in pantry, island breakfast bar & a separate eating area! Special interior features include dual staircases to the second floor, wet-bar for easy entertaining, 3 fire places, two-story foyer & breathtaking two-story family room w/ cat-walk overlooking from above! Don't miss the incredible outdoor space including an upgraded paver patio w/ lighted seat wall, gas-start fire pit, & built-in attached grill over-looking hole 1. This tranquil setting is perfect for relaxing or entertainment! A home like this with that stunning view would be a dream come true!